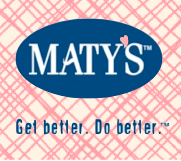 Maty's all natural home remedies were designed by a Mom for her daughter Maty when she was born with severe heart defects. Carolyn sought out traditional natural healing products for her daughter whose immune system was easily compromised. 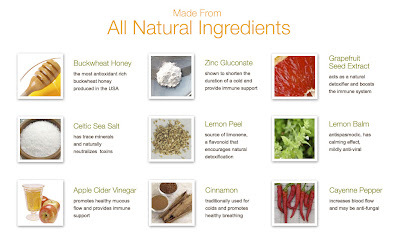 Natural products that have stood the test of time in healing our bodies naturally. She now shares these recipes with us through Maty's products! Over the counter cough syrups often contain alcohol and drugs that I don't care to give to my young children. 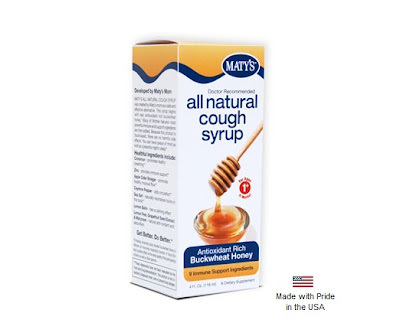 I had always heard that honey helps with coughs, and the All Natural Kids Cough Syrup from Maty's works wonders, and it's main ingredient is buckwheat honey! No side affects. I wanted to review this when we had coughs to actually try it out, so it took awhile as we were amazingly healthy this year! My 10 year old had a cough and I was like .. yes, we can try out Maty's now! It is quite a bit thicker than the over the counter cough syrup. Be sure to shake it good first, and pour slowly on the spoon. It smelled fantastic and tasted like honey. Such a better flavor than the artificial junk in cough meds over the counter! There is also an All Natural Cough Syrup for adults, though kids can take it too, as there are no adverse side affects or ingredients. It is not flavored with caramel banana like the kids version. Check out these all natural ingredients!! You won't be fearful to give these to your child or sick hubby! 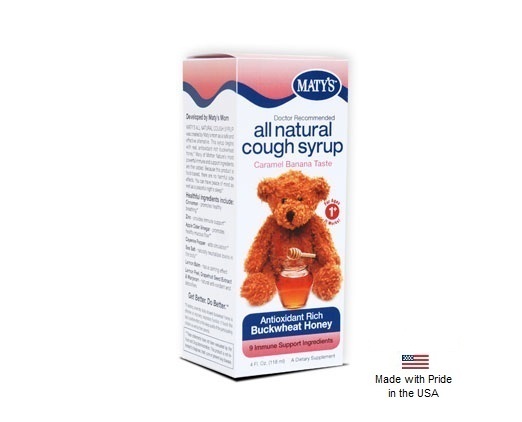 Maty's will be a cough syrup that we keep on hand. My kids may still wrinkle their noses at it a bit, but it is suppossed to help them get well, not be a sweet treat. I personally thought it tasted great! These are only $8.99 a bottle, all natural and Made in the USA!! Put Maty's at the top of your list!! I have never heard of or seen Matty's before. Thanks for sharing! I also love that ingredients really are natural! Ooooh, thank you for sharing! I'd never heard of this stuff! I've really been wanting to try this for my son. We always use natural cough remedies. We have this and love it!!! Cough Bronchial Syrup with zinc - cough suppressant and expectorant.